Ulysse Nardin, was a highly accomplished watchmaker born in 1823 in Le Locle, Switzerland. He was trained under his father, Leonard-Frederic Nardin and later perfected his skills with two master watchmakers, Frederic William Dubois and Louis JeanRichard-dit-Bressel. Ulysse Nardin, the company, was founded in 1846 and remained under Ulysse’s control until his passing in 1876, when his 21 year old son, Paul-David Nardin took over. Since the founding of the company, Ulysse Nardin have been known for their high quality and high accuracy craftsmanship, so much so that they have become known worldwide for their Marine Chronometers, the most accurate mechanical clocks ever made, achieving a precision of around a tenth of a second per day. In exhibitions held at various locations around the world, such as Paris, London, Tokyo or Buenos Aires, Ulysse Nardin received a total of….. 14 Grands Prix (First Prizes), the “Prize Medal” (1862 – London International Exhibition), the “Progress Medal”, 10 Gold Medals, 2 Prix d’Honneur, 2 Silver Medals. 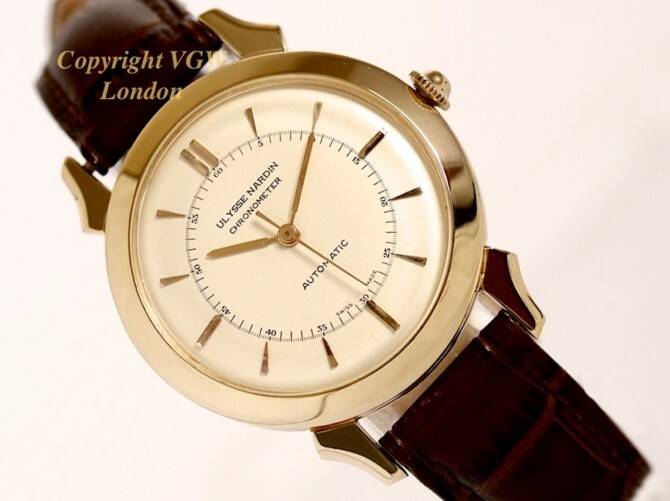 This simply beautiful 1956 vintage automatic gentleman’s dress watch in 14ct yellow gold has just become available, having previously been taken in as a part-exchange from a fastidious collector. Our team of restorers have done another wonderful job of restoring this watch, including the dial, movement and the case. The case is particularly pleasing with an elegant profile, rounded case-back and beautifully shaped lugs. The two-tone ivory cream dial is also a wonderful design and has been beautifully restored. This watch must have been kept for special occasions and had a very careful previous owner, as it shows no signs of wear or any flaws to distinguish it from a new watch! It really is that good. The two-tone Ivory Cream dial with original ‘index’ hands, matched with applied baton hour indices. Simply stunning and just the kind of look, modern watch brands are currently scrambling through their back catalogues, to try and emulate again with their re-issues and heritage editions. This is the original dial which has been restored to the highest standards by our dial restorers, which are considered to be the best in the UK. The 14ct yellow gold watch case measures 34.5mm, excluding the period crown. The case is beautifully designed with a very pleasing profile and very attractive shaped lugs. The case is completely flawless and totally immaculate, with no scratches, dings or other damage or any signs of wear. The beautifully rounded case-back is typical of the mid-50’s and has a perfect mirror finish. The original Ulysse Nardin Felsa 690, 21 Jewel automatic Chronometer movement is in sparkling condition following a full overhaul and service by our watchmaker. These movements are highly regarded for accuracy and reliability and on completion of the work and final calibration, we have tested the movement on our electronic time-grapher and it is now running within +12 seconds per day which is excellent for any watch of this age. *Please note, the 12 months warranty is only applicable if the list price is paid. The watch has been fitted with a very high quality dark brown “croc’ strap with a gold plated buckle. If you would prefer a different colour or style of strap please let us know and we will do our best to oblige. Although there are no original papers with this watch, the reference numbers, markings, signatures and hallmarks are all correct, indicating the date to be circa 1956. Detailed particulars will be included with the receipt, along with our 12 months warranty*. A separate insurance valuation for the replacement value will also be provided at the time of sale, along with our ‘Lifetime Authenticity Guarantee’ which states: “If this watch proves to be anything less than totally authentic, or not as described, Vintage Gold Watches of London will offer you a full refund at any time”. The watch also comes complete with a hardwood presentation box as shown in the photographs. A beautiful example of a top of the range Ulysses Nardin automatic dress watch with a stunning case and dial. The movement is of a very high grade and on a par with watches far more expensive than this. A word about our prices – We always try our hardest to acquire the very highest quality watches we can find, before restoring these to the highest possible standards. We then offer these at the fairest prices we can, taking into account our pre and post sales care and service. This approach inevitably means we will never be the cheapest, but nor will we be the most expensive. Indeed there are a number of well-known stores in West London which are very successful, charging between two to three times the price you see here. We therefore consider our prices to be fair, given the quality of watches we have to offer. We are happy to accept PayPal as this is the quickest method of payment. However, if you wish to pay by bank transfer, we will be pleased to pass on a 3% transaction saving to you. Similarly, if you wish to pay by International SWIFT or International Bank Wire Transfer, we will provide you with our BIC / Swift number and our IBAN number. Please note, we welcome part exchanges and if you have a watch or small collection for sale, please contact us as we will be happy to discuss this. We will be happy to Service, Repair or Restore your watch, all at ‘sensible’ prices. Please see here. If you have any questions, please call our landline 020 7727 7095 or mobile 07515 949 250, or if calling from overseas our landline number is +44 207 727 7095 or mobile +44 7515 949 250. We await your call! We will be happy to answer any questions and offer advice about this or any of our watches listed for sale. If you would like some general advice regarding any aspect of vintage watches, including buying, selling, or collecting, we will also be very happy to hear from you. Finally, please enjoy some time spent viewing our other fine Vintage Gold Watches!